EATER.COM -- "Hello, In-N-Out (pictured above) fanatics who do not live in California, Utah, Nevada or the Dallas-Fort Worth metro area. 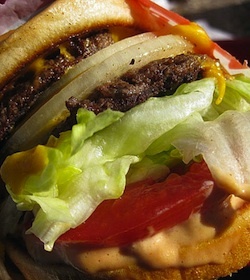 Today is your lucky day: website Midtown Row (online speciality food retailer) is offering to overnight two frozen double-doubles — classic OR animal style — to your pathetic, non-In-N-Out-having location for the low (high?) price of $50 plus $6 shipping. Burgers will be shipped from California November 1." One transplanted California fanatic feels so strongly about "In-N-Out" burgers that she was brought to tears when the chain recently opened a new restaurant in Dallas. "Today is your lucky day:"
Your lucky days should begin November 1st, for shipments of In-N-Out burgers from Midtown row. For me, this falls in the iPod category of things I don't need. Shocking. Not as shocking as those who overpay for wine names, but shocking none-the-less.